I bought is car new in 2005 and have owned it for 12 years. It stills runs great, but the engine is starting to make some wierd noises. 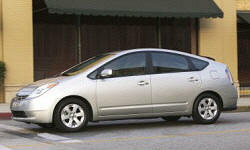 Why the 2005 Toyota Prius? The car has many standard features. 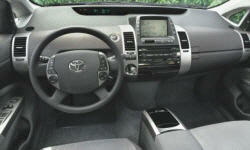 It has automatic climate control and a touchscreen standard. There are a bunch off fuel economy saving guages on the screen that help you with saving gas. The interior is very well put together. There are many hard plastics, but everything feels solid and nothing has ever broken off. The front armrest console has fabric that has worn off over time. The seats are beige and very hard to clean. There are many stains. There is a LOT of storage in this car. I can bring an entire camping trip's worth of stuff in the car. The trunk is huge! Many storage compartments to keep things safe. I have only had to fix recalls and an A/C blower that went out a couple weeks ago. Nothing major at all. The car gets great fuel economy. About 35-41 mpg. The seats are surprisingly comfortable in the front. It has tons of lumbar support and the seats fit me perfectly. There is a lot of foot room. Why Not the 2005 Toyota Prius? The engine is extremely loud when accelerating almost anywhere. It's REALLY slow. About 10.1 sec 0-60 when new. About 12 sec I'm guessing now. The battery is getting weaker and can doesnt run as often in EV mode as it used to. I have to floor the car often to get on the freeway. This lowers MPG a LOT. This is why I don't really get the advertised MPG. The shocks are going out and I don't really want to pay for them because they will be worth half of what the car is worth. The ride gets choppy at times. It is terrible, but is not one of it's strong points. The wind noise is loud, which is wierd because it is aerodynamic. There is also a lot of road noise, which gets annoying. I expect this out of a hybrid, but there is no steering feel and the steering wheel doesn't feel connected to the road. It isn't very fun to drive. Also, when driving in a parking lot or when you're turning the wheels at low speed, the steering wheel is very heavy and hard to turn. The low rolling resistance tires give the car it's great fuel economy. These tires have no grip and when you're in an emergency situation, the car understeers. When going around a corner, it understeers. This is a huge reason why the car handles badly. I bought it new in Salsa Red Pearl. The paint is starting to peel. Everything is very easy to use. There are many buttons on the steering wheel from a/c to audio controls to cruise control. The braking is very touchy because they regenerate power to the hybrid battery. It stops VERY quickly though. The rear seat is very hard and not that comfortable. There is a lot of room though and easy to see out of the car. I'm going to keep this car until it dies.